Project Inspired By: My 5 year old son. He pulled a piece of PVC pipe out of the garbage and asked if we could make a project with it. 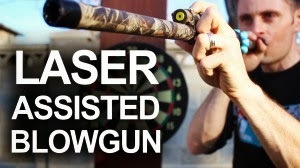 A blowgun was the first idea that came to mind, and quickly snowballed into a really awesome project idea! The blow gun is so simple and cheap to make, anyone can do it, and the best part is it looks completely legit, and can fire with amazing precision. I let my kids try shooting darts made with nails, but their lungs weren't powerful enough to get the darts to stick into targets, so we use marshmallows instead. The pipe is the perfect width for mini-marshmallows and can still shoot them fast enough to hurt a little, but still safe enough for indoor use. The blow guns can be customized with different color schemes in a way that's so simple it's nearly mind blowing.